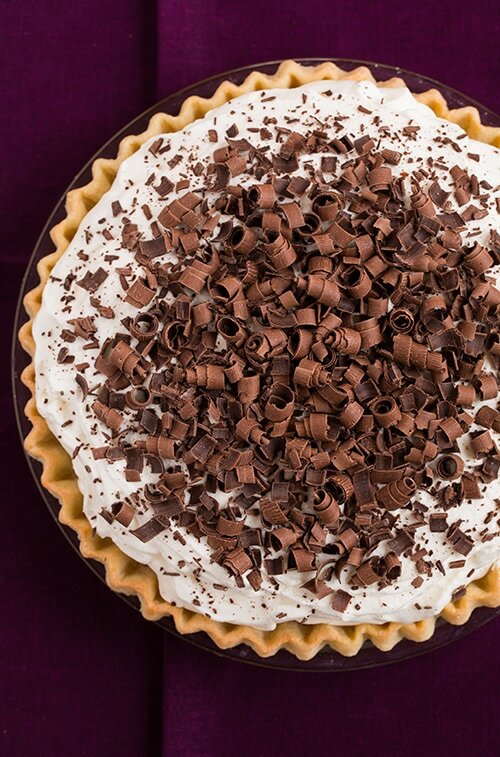 French Silk Pie – chocolate lovers look no further for a pie to make this holiday season. This might just be one of the best pies you may ever eat! I know that this is a bold statement but it’s true, especially for you chocolate addicts, like myself. 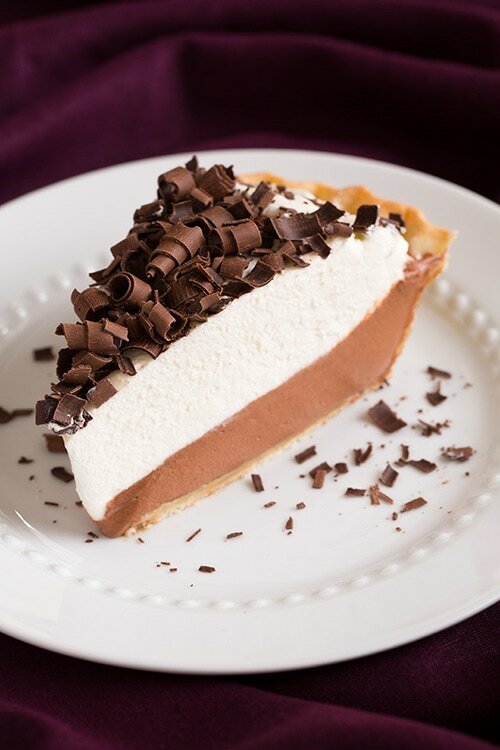 This luscious chocolatey pie, is my idea of pie perfection. The Ultimate Homemade French Silk Pie! I’m so excited my Mom just flew into visit. I wanted to make something I knew she’d love so of course the first thing that came to mind is something loaded with chocolate. 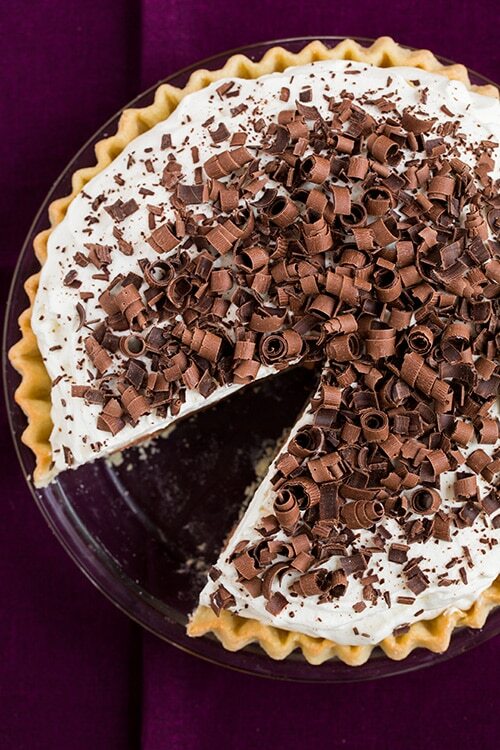 And is there a better way to welcome someone than with chocolate pie? 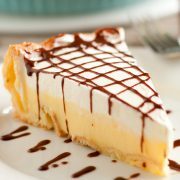 But please, let’s not refer to this pie as simply “chocolate pie”, this is the ultimate luxury of chocolate pies. 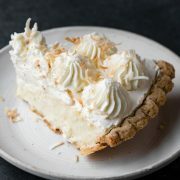 With its incredibly satiny smooth texture that just melts away in your mouth, in a way like nothing else, you’ll begin to realize why this is called French Silk Pie. It’s silky smooth consistency is to die for. While I was cutting the first slice, my daughter was standing by my side and peering in and asked “how is it so smooth?” and basically I was like “this my child, is French Silk Pie” :). She couldn’t get enough of the chocolate portion, she kept digging into it by the spoonful, while leaving behind the cream and crust. You have to try this to understand and appreciate it’s delectability, it’s hard to describe or compare it in words but it’s something similar to a velvety smooth, chocolate ice cream or a rich chocolate pudding. You like chocolate? Make this pie. And of course, please enjoy and savor every bite just as I did! Combine 3/4 cup + 2 Tbsp granulated sugar, the light brown sugar, salt and eggs in a heat proof bowl set over a pot of simmering water. Heat stirring constantly until reaches 160 degrees on a candy thermometer. Remove from heat, stir in chocolate chips (melt through) and vanilla. Let cool to room temp. In an electric mixer whip butter on medium-high speed until pale and fluffy. Add in cooled chocolate mixture and whip until pale and fluffy. In a large bowl, whisk together cocoa and remaining 2 Tbsp granulated sugar, then while whisking, slowly pour in about 1/2 cup of the heavy cream and stir until smooth. Add remaining 3/4 cup heavy cream, whip with mixer until stiff peaks form. Fold whipped cream mixture into melted chocolate chip/butter mixture. 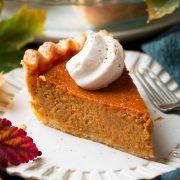 Pour into prepared pie crust and smooth into an even layer. Tent with foil (sealing foil around edges) and chill to set. Top with sweetened whipped cream and chocolate shavings. The best French silk pie recipe! Deliciously rich, perfectly chocolatey and lusciously fluffy and silky smooth. Combine 3/4 cup + 2 Tbsp granulated sugar, the light brown sugar, salt and eggs in a heat proof bowl set over a pot of simmering water. Allow mixture to heat over simmering water, whisking constantly, until it registers 160 degrees on a candy thermometer, about 8 minutes. Remove from heat, add chocolate chips and stir until chocolate has melted, then mix in vanilla. Allow mixture to rest until it reaches 75 degrees, stirring occasionally (you can put it in the fridge to cool faster). In a large mixing bowl, whisk together cocoa and remaining 2 Tbsp granulated sugar, then while whisking, slowly pour in about 1/2 cup of the heavy cream and stir until smooth. Add remaining 3/4 cup heavy cream, then using an electric hand mixer set on high speed, whip until stiff peaks form. Fold whipped cream mixture into melted chocolate chip/butter mixture. Pour into prepared pie crust and smooth into an even layer. Tent with foil (sealing foil around edges) and chill in refrigerator overnight. Before serving, in a mixing bowl whip 2 1/2 cups heavy cream until soft peaks form. Add in granulated sugar and whip until stiff peaks form. Spread over set pie and garnish top with chocolate. Cut into slices and serve chilled. Store in refrigerator.